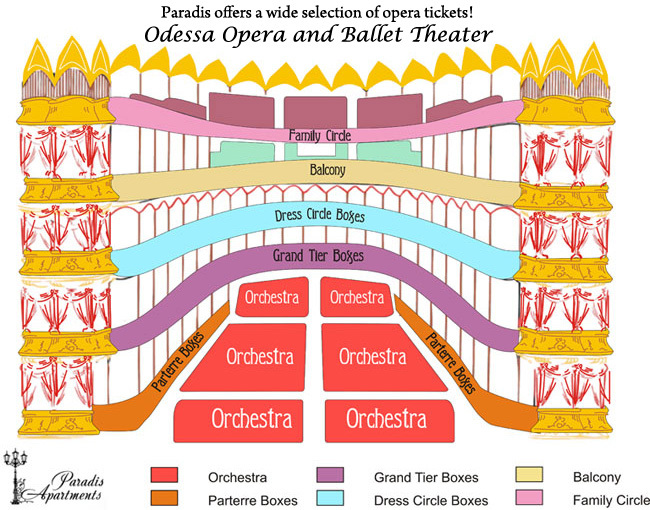 We offer tickets to the Odessa Opera Theater. Need to buy tickets? Email us! Please, check repertoire page and let us know what you like. The Odessa National Academic Theater of Opera and Ballet is a harmonic combination of the exquisite architecture, historical heritage of Odessa and romantic charm of the south. Airу columns, fine sculptures and a range of the street lamps framing the theatre, accentuate its unique image. This Opera theatre was built in 1887 on a place of the first building of the theatre burnt down in 1973. For the new building architects F. Felner and Y. Helmer had selected style of the Viennese baroque. Style of the French rococo reigns inside. While stepping up the marble stairs you can feel like a lady or a gentleman from the past ages. The hall is richly decorated with gold leaf, stucco works, bronze candelabrums and burgundy velvet. The ceiling is decorated with pictures-medallions made by artist Lefler illustrating Shakespeare’s literary works. Huge crystal ceiling lamp amazes imagination. Acoustics of the theater hall is unique: even a whisper can be heard in every part of the hall. Honour to the theatre was rendered by Tchaikovsky, Rakhmaninov, Caruso, Shalyapin, Isadora Duncan, Anna Pavlova and many other famous creative persons. 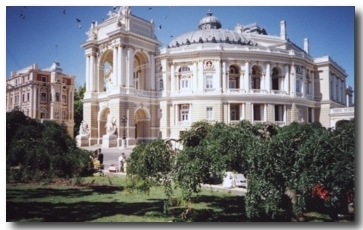 Inhabitants of Odessa tenderly name their Opera theatre as "cake" and treat the visitors to a tasty “dessert”: remarkable operas and ballets.